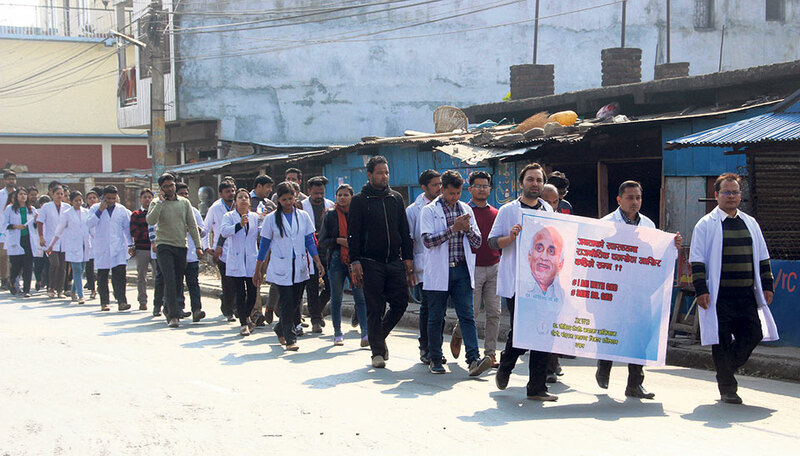 DHARAN, Feb 1: Doctors at the Dharan-based BP Koirala Institute of Health Sciences (BPKIHS) on Thursday organized a rally in support of senior orthopedic surgeon Dr Govinda KC, who is currently undertaking his 16th fast-unto-death demanding crucial reforms in the medical education sector. With Dr KC's health deteriorating fast and his hunger strike entering the 23rd day on Thursday, the protesting doctors demanded that the government promptly sit for dialogue with Dr KC and address his demands. They threatened to shut down even the emergency service if the government fails to take concrete steps to address Dr KC's demands. Likewise, doctors affiliated to both Junior Resident Welfare Society of BPKIHS and Nepal Medical Association have also joined the protest. The joint march started from BPKIHS's General Outpatient Department, circled Bhanu Chowk and converted into a corner's meeting after reaching back the hospital.The protesting doctors carried placards and chanted critical slogans against the government during the rally. The junior residents of the hospital boycotted OPD services and organized a sit-in in front of the hospital. A majority of the doctors have stopped providing OPD service since January 25.“The government is neglecting Dr KC's demands. So we are forced to abandon our work and protest against the government,” said Dr Kaviraj Paudel, chairman of the Junior Resident. He further threatened to intensify their protests if the government continues the disinterest in addressing Dr KC's demands.According to Dr Paudel, their sit-in protest will continue until the demands are met. “We do not want to deprive the people of important services but we are left with no choice.”Likewise, the Dharan chapter of Nepal Medical Association has been organizing a relay hunger strike for the same cause for the past three days. They have been organizing the relay strike from 10 am to 5 pm.“We are organizing the relay hunger strike in support of Dr KC as per the decision taken by our central office. We strongly demand that the government save Dr KC's life by addressing his demands,” said Prof Dr Raju Rijal, chair of the Dharan chapter of the association. Protests by the working professionals have severely affected the medical services. The number of service seekers at the OPD of BPKIHS has drastically increased while only a few doctors providing the service. The hospital receives around 2,000 patients every day.